Going wide in the storm. Mark Wallheiser is interviewed on 97.9ESPN Tallahassee by Brien Sorne. 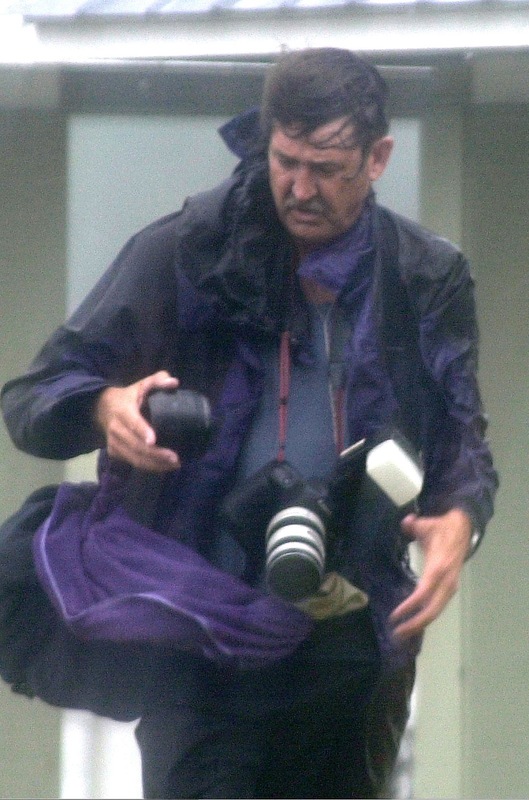 To me there only one way to cover most anything and especially the only way to cover a hurricane is ditch the 70-200 and pick up the 16-35. 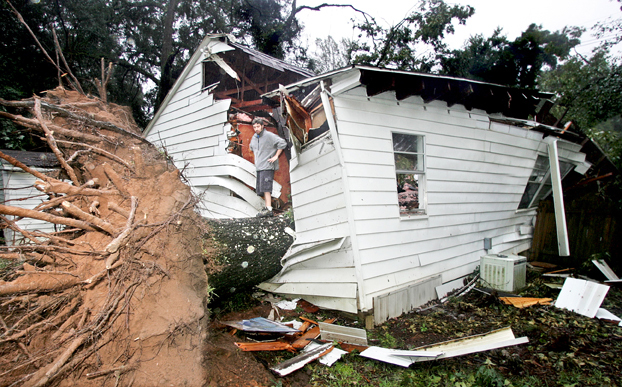 Going wide in the storm forces one to interact with the survivors to get to know them, empathize with their plight and bring a piece of their personality to the film plane. Don’t get me wrong, I have a 70-200 slung over one shoulder and in many instances it makes the best frame in a series but after editing for my “Interview with a Hurricane” exhibition opening at 621 Gallery in Tallahassee May 6th through the 26th almost always the 70-200 was quickly followed up with the 16-35. In the film, pre-zoom days, it was the 24mm. It’s interesting going back and editing negs 25-30 years later for the exhibit and seeing how I shot, the progression and in most cases read my notes and IDs that I almost always stuffed in my negative envelopes. The first few hurricane notes were hard to read because the ink had run until I discovered that pencils don’t bleed in the rain. Interview with a Hurricane is a 50 print exhibition curated by Kenny Irby of the Poynter Institute, from the 16 hurricanes and 11 tropical storms I’ve covered since landing in Tallahassee in 1981. Sunday May 6th from 3 until 5 pm, stop by the Nan Boynton Gallery inside 621 Gallery for the official opening. 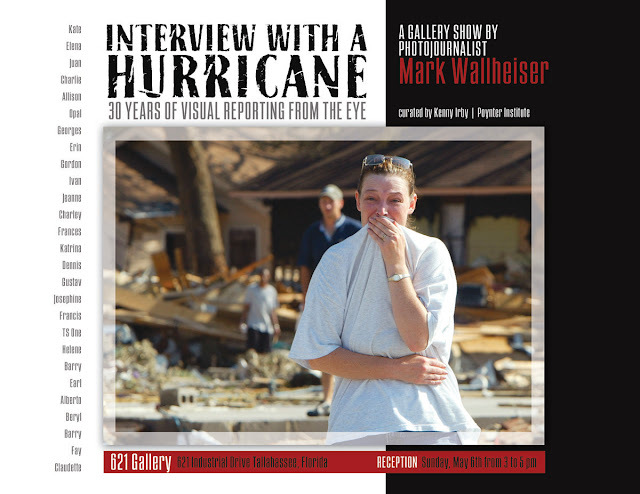 The show runs the month of May leading up to the 2012 hurricane season and is showcasing my photo reportage over the past 30 years. Cold beer and wine is part of the lure, of course. 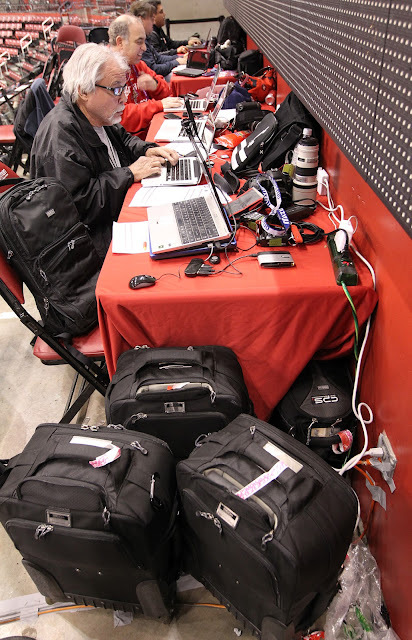 A cluster of Think Tank Photo camera bag rollers spotted at a Florida Panthers vs the New Jersey Devils hockey playoff match. At left is AP's J Pat Carter, at front, and Panthers team photographer Eliot Schechter. 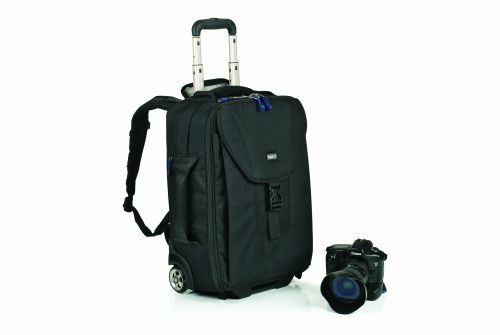 Our friends at Think Tank Photo just announced a special deal on their popular rolling camera bags. Order their Airport Security V2.0, Airport International V2.0, Airport Airstream, or Airport TakeOff rolling camera bags before May 31, 2012 and you will receive one of their Artificial Intelligence V2.0 laptop sleeves for free! This is a $59 value. Their Airport rolling camera bags are considered the best designed, most durable in the industry. Backed by Think Tank’s "No Rhetoric Warranty" and great customer service, their rollers have traveled millions of miles and been used on every continent. All of Think Tank’s rollers are designed with the intention of helping you keep your bodies, lenses, and accessories near you at all times, even while flying. Think Tank actually designs their rollers to comply with airline carry-on size requirements. All of the rollers share three levels of security (TSA approved combination locks, front laptop cable and lock, and back cable and lock for securing entire bag to fixed object). They employ the highest grade materials, including all fabric exterior treated with DWR (underside fabric underside is coated with PU for superior water resistance), 1680D ballistic nylon, abrasion resistant YKK® RC Fuse zippers, custom designed extra tall skid plates, replaceable in-line skate wheels, antique nickel plated metal hardware, nylon webbing, and 3-ply bonded nylon thread. If you are looking to buy a roller before you head out this summer, this is a great time to do so!